Looking for easy do-it-yourself Halloween projects? Then you’re in the right place! From Frankenstein to a pumpkin clock, here are three fun Halloween projects that are great for all ages. Build a great-looking Pumpkin Clock this Halloween with just a couple of Klockit components! First, select a pumpkin from your local farm stand or grocery store and carve out the insides. Then, install a clock movement and clock hands to the front of the pumpkin. Last but not least, carve or paint numerals on the face of your pumpkin clock. Easily create a spooky Luminary Lantern to add to your decor this Halloween season. Simply purchase and build our Luminary Lantern Kit. Insert our new Halloween panels on each side of the lantern. Last but not least, light up the spooky panels using our LED tealight and remote. Craft a scary Frankenstein Clock this Halloween with just three Klockit components! Purchase our bracket clock case and create a Frankenstein theme using green and black paint. Attach our rubber mounting ring to the white clock insert and mount into the clock case. Great weekend project! Is your project feeling more tedious than enjoyable? While I absolutely enjoy woodworking as business and a hobby, I have to admit that there have been times when my projects seem uninteresting. BUT – I have come to the conclusion that the best way to ensure that woodworking projects remain interesting and challenging is to avoid falling into a “RUT”, where you use the same construction and finishing techniques. Using different materials – like lumber and hardware – as well as different machining methods and wood finishing products will challenge your woodworking skills, plus provide a sense of greater satisfaction with your completed projects. 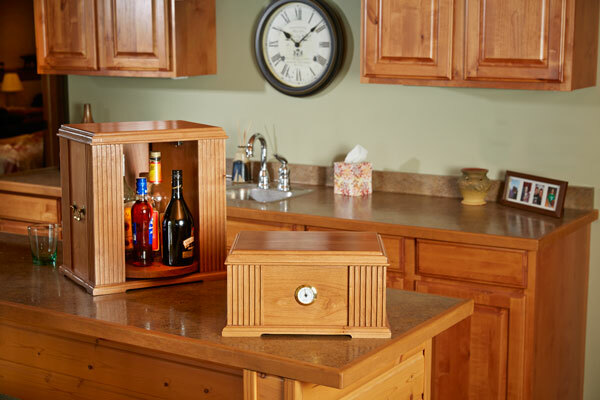 A perfect case in point is the cigar humidor and tabletop liquor cabinet plan models I have just completed for Klockit. I made the models with Alder, a lumber I had not previously used. While Alder is an affordable alternative to Cherry, it does present certain machining and finishing challenges. These projects also provided me with the opportunity to re-saw ¾” thick lumber on my band saw for the first time…ever. The cigar humidor provided me with the challenge of edge gluing ¼” thick solid Spanish Cedar lumber panels. These new techniques and methods kept me focused and gave me a feeling of pride and satisfaction I had not felt on recent projects.